I’m 19 days and 19 books into summer. One of the first things I think about in planning for the upcoming school year is my why. Not what I want my results to be. Or how I’m going to get there. Or even what I want students to learn. It’s why I structure my classroom the way I do. Why do I carve out time for silent reading? Every. Single. Day. Why do I let my students choose what they read and write about? Why do I read aloud poems, and picture books, and short stories, and novels? And show speeches, and commercials, and TED Talks and clips from Game of Thrones? It’s because I value being a reader and writer and I want my students to have authentic experiences in my classroom. One of the foundations of my reading and writing community is our read alouds. I love these three books because they’re about differences. All of them lead to powerful conversations that permeate our classroom all year long. During the rest of the year, students have choice in the read alouds, and vote based on genre, topic, and how they want to feel when we read it. Below are some read alouds I’ve done in the past, along with a few that I'm considering, categorized by emotions. 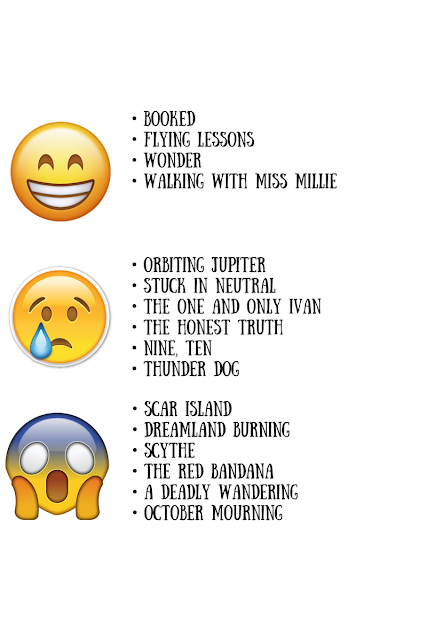 What chapter books are you thinking about reading aloud? The Red Bandana. is my top contender for our first read aloud. The kind folks at Penguin Random House sent me an ARC of the Young Adult edition, so I’m anxious to see how that compares to the adult version. If you’re not familiar with this story, it’s about a former Boston lacrosse player who helped people evacuate the World Trade Center buildings on 9/11. Check out the Nerdy Book Club post for more resources.